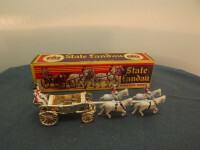 This model is the Benbros State Landau and Horses in gold with hand painted horses and riders in black, red, and white. 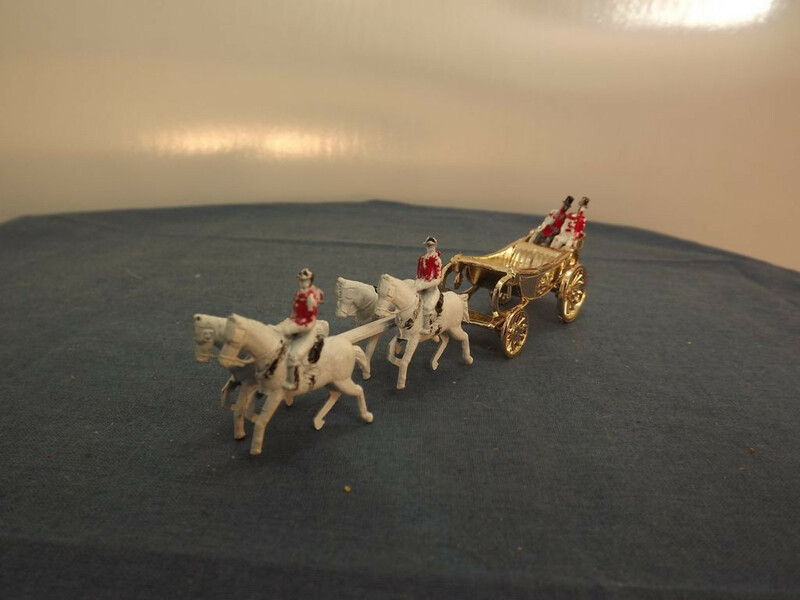 The model of the coach has a one-piece, cast metal body, 50mm in length, 20mm high and 14mm wide. 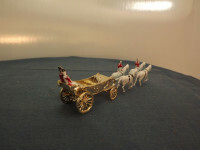 At the front is a gold plated draw-bar hole for attaching the horses. The coach body has a crest cast on both doors and the open interior ahs forward and rear facing seats. 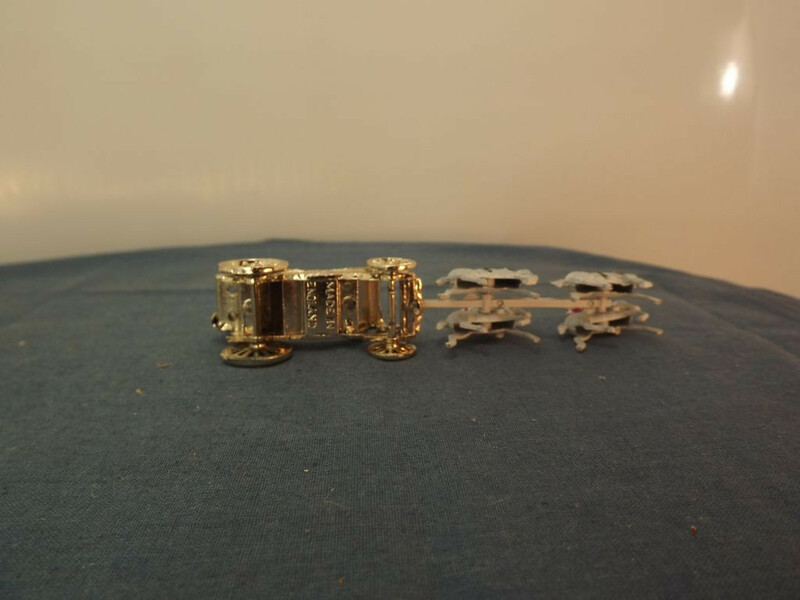 The rear top seat carries the two small cast figures painted in white, red and black, cast just behind the rear axle. with The underside of the coach is cast the legend "Made in England". 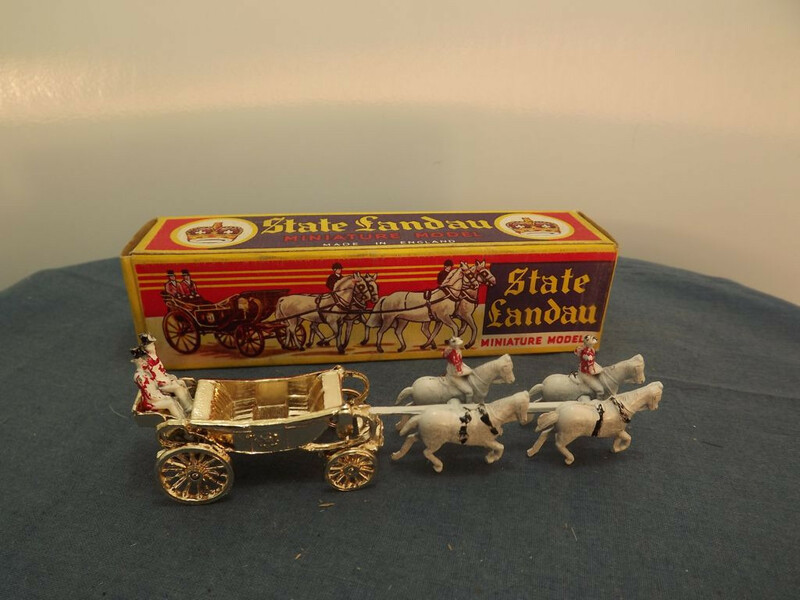 All four horses and two riders are cast a separate units, as is the draw bar to which they are press fitted. Each white horse has black painted harnesses and the left side horses have white riders with painted red jackets, black helmets and boots sitting on black saddles. The draw-bar has no markings. The model is 105mm long when the horses are attached to the coach. 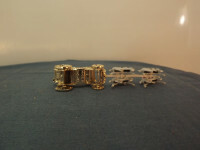 The model is fitted with gold plated metal wheels fitted to gold plated axles that are held in place by passing through the coach body and appear to be pressure fitted. There is no "base" to the model, the underside of the body is simply part of the coach body and is marked "Made in England". This item was first issued in 1953 for the Queen's Coronation and came in a Benbros Qualitoy box.